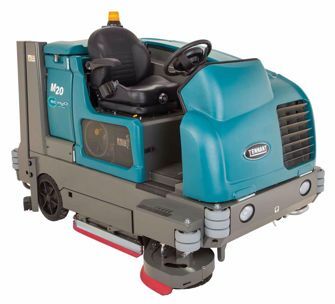 The Tennant M20 LP/Propane, Gas, and Diesel scrubber-sweepers have become the new industry standard for internal combustion powered floor cleaning machines. This fully integrated floor cleaning machine, available in LP, Gas, and Diesel, is capable of heavy scrubbing, dry sweeping, and accomplishing both tasks at once. Tennant originated and perfected the concept of a front wheel drive/front wheel steer scrubber sweeper. This system allows operators to clean into corners easily maneuver around obstacles. Seating the operator up front provides excellent visibility for optimal cleaning while maximizing operator safety. Scrubber-Sweeper designs over the years were typically very complicated. Machine designs tried to incorporate two machines in one with separate sweeping and scrubbing systems. The result was equipment with many moving parts requiring very complicated hydraulics and controls. Tennant’s M20 and the larger M30 designs reduced the need for 2 cleaning systems. This machine has all the advantages of previous sweeper scrubbers while eliminating half of the parts necessary to make it work. With the touch of a button operators can transition from a scrubber/sweeper to dry sweeping. The “high dump” feature is the first of its kind for a scrubber sweeper. Operators can empty the debris hopper automatically into containers as tall as 60”. Simple design and heavy duty construction make this the most reliable LP, gas, or diesel scrubber-sweeper available today. Enhanced visibility and extreme maneuverability will keep your operator safe and productive.